MANIFEST YOUR OWN YOGA BOTTOM COLLECTION! Yes, its true, and it's very simple. Great for Gifts and Boutiques! 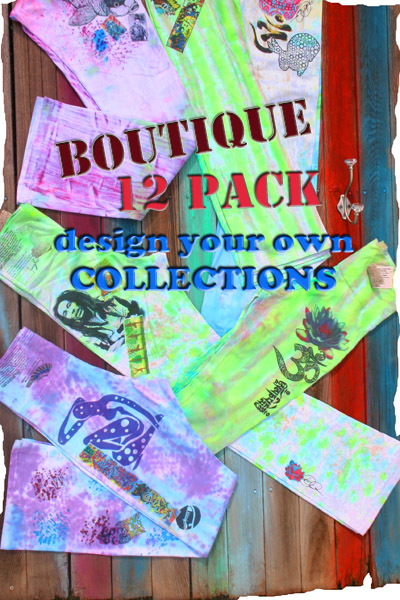 1st- Select an Image Theme, or give us 2-3 themes of your own for the art on your pants collection. Don't worry, whatever you mention we will use as inspiration to create some amazing art for your pants. You can have 12 unique and different pair, or have us make 4 sets of 3. Previous customer theme examples include, "om", "elephants", "peace", "flowers", "Sanskrit", "graffiti". Anything is game! You can even upload your own logo or images if you like. Your image theme(s) will be used to create a cohesive collection and we will hand paint the colors of your choice on them as well:) IF YOU WOULD LIKE DIFFERENT SIZES JUST LIST YOUR SIZE BREAKDOWN IN NOTES DURING CHECKOUT. 2nd- Sit back and wait 12-28 days for your one of a kind yoga pants to arrive, slip them on, snap a picture for us.